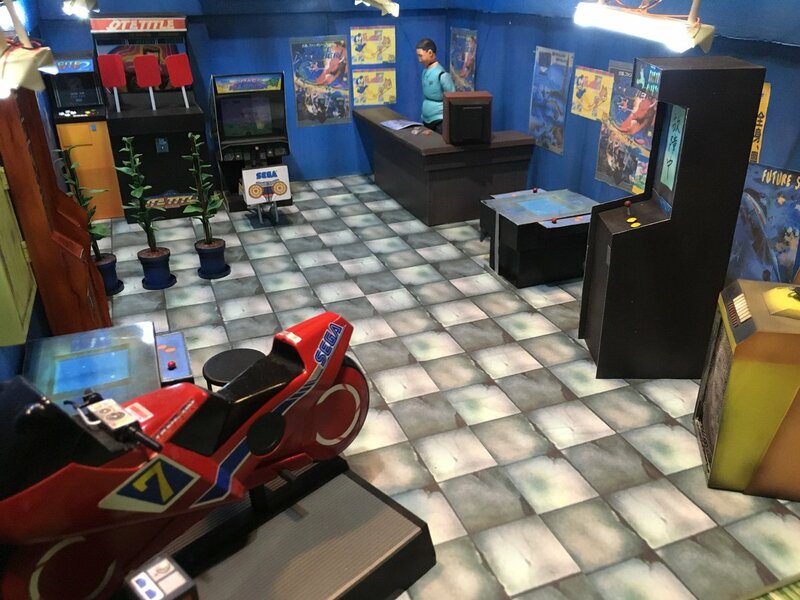 Earlier this year, a talented Shenmue fan and model hobbyist in Japan completed an amazingly-accurate scale model diorama recreation of the interior of Shenmue's You Arcade. Diorama of the You Arcade: view from the front. 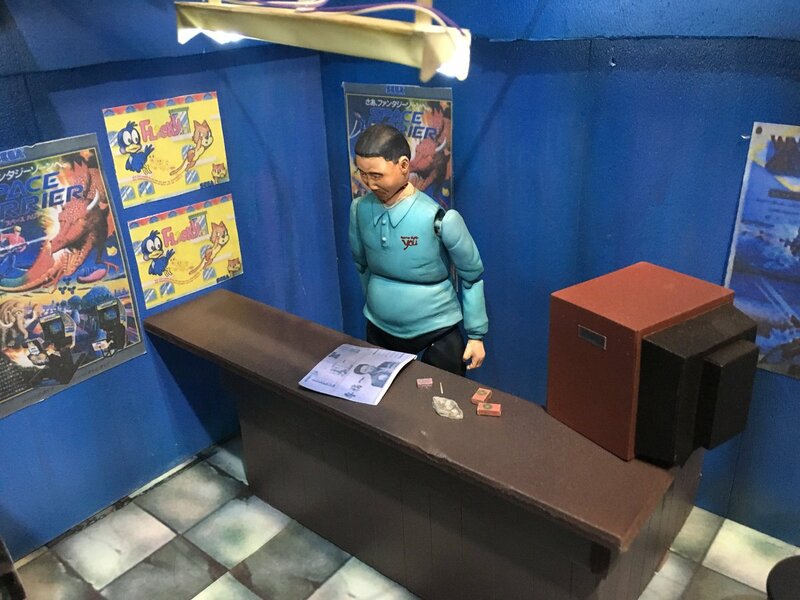 We got in touch by email with the fan who created the diorama, Hiroaki Suzuki - who coincidentally shares the same surname as the series' creator - to ask what prompted him to embark on such a project and find out exactly how it was made. (All images and videos of the diorama were included with the creator's kind permission. Note that the responses have been translated from Japanese). An image and video gallery follows the interview. Q: To start with, please tell us a bit about yourself. HS: My real name is Hiroaki Suzuki. I teach the drums in Japan and as a hobby I mold figures and build model kits. Q: What does Shenmue mean for you? 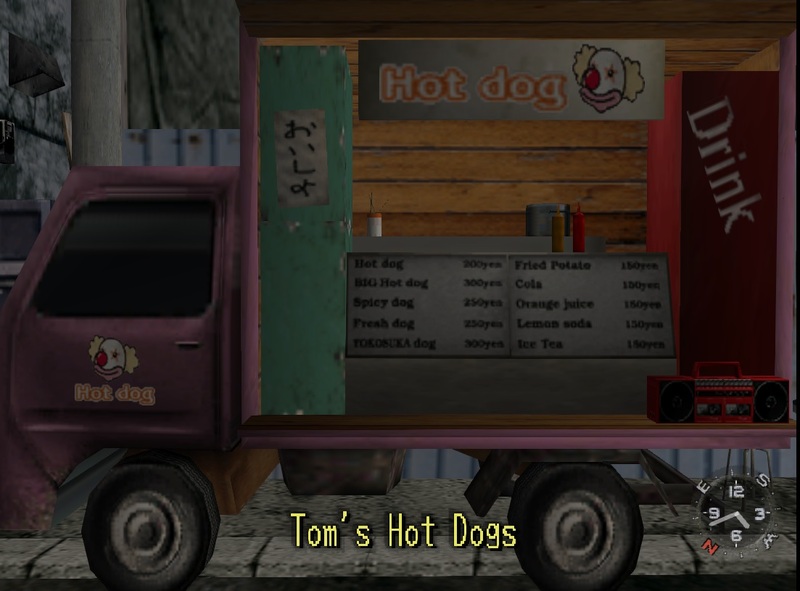 What memories do you have about playing Shenmue? HS: I came across Shenmue when I was about 12 or 13 years old. The first time I played, I found it hard and I remember spending all my time playing at the You Arcade. Shenmue has taught me many things: to be thoughtful to those around you; the wonderfulness of helping each other; and the importance of making an effort. In my work now as an instructor, I hope I’m able to pass on some of the things I grew to feel through Shenmue. Q: How did you feel when Shenmue 3 was announced in 2015? What expectations do you have for it? HS: I couldn’t believe it when it was announced. I thought I was dreaming. Then when the trailer was shown by Sony I realized it was true… It was an indescribable feeling. Shenmue has a lot of quotable lines, so I hope there will be some great quotes in Shenmue 3 also. I’m also looking forward to seeing the craftsmanship in the buildings and exploring them. Q: When did you start getting involved with molding and making model kits? What kind of things have you made? HS: I started building model kits from around 8 years old, and molding from about age 25. I make a wide range of things including Zoids, Mini 4WDs, tanks and Gundam models. Left: plastic model kits from Mr Suzuki's collection; Right: a completed and painted Gundam HG V2 model. Figures I have molded include the vocalist and guitarist from the overseas metal band GWAR. I have also made a diorama of Nausicaä of the Valley of the Wind. 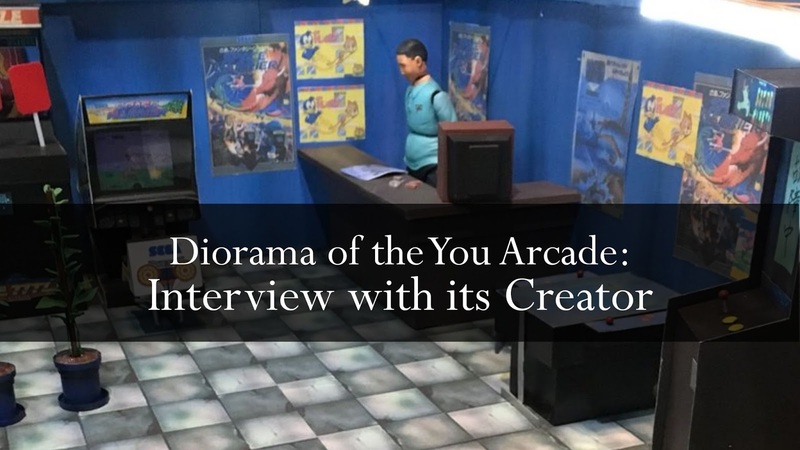 Q: Why did you decide to create a diorama of the You Arcade? HS: Being a place I always used to play when I was a child, I wanted something to remember it by. Also I wanted to express, in my own way, my joy at Shenmue 3’s announcement. Q: It would seem that you have used a lot of different methods for creating the objects in the You Arcade: how did you go about making Hang-On? HS: In fact, Hang-On comes as a plastic model kit put out by a company called wave. I assembled the model and applied coats of paint to it. The Hang-On model kit (left) and completed model (right). Q: Taking Space Harrier next, how did its method of creation differ from Hang-On? HS: Aside from Hang-On, all the others were completely self-made, which I did by drawing up the designs using software called SketchUp, then cutting out the shapes from a sheet of plastic to create them. 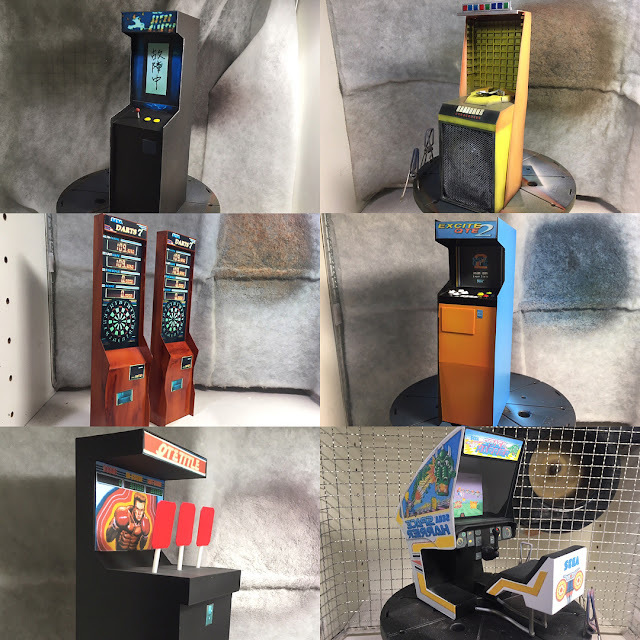 The process of building an arcade cabinet from scratch: (1) The cabinet dimensions is modeled using 3D design software; (2) The components are printed and cut out from a plastic sheet; (3) the cabinet is assembled; (4) paint is applied; (5) labels and other details are attached. Creating the fluorescent light fittings (left), pots for the pot-plants (middle) and the television for the counter (right). Making the power box on the wall of the arcade. Q: The mechanism in the Jukebox that turns the records and so on is amazing! In your blog you mention that this was based on Japanese traditional mechanisms. Could you explain more about that? The intricate self-made jukebox mechanism spins the disc rack, lowers a disc and moves the record player arm across, all with a single turn of a shaft. HS: Thank you! I had a pretty hard time making it, because I aimed to not just have movement, but for a single action to move all the parts in turn. As I puzzled over it, I happened to see a TV program about karakuri puppets (Japanese mechanized puppets). With karakuri puppets, a single driving force moves everything, so I thought “That’s what I want!”. So next I gathered research material and took notes while watching them about how the power is transmitted, to create the design. An example of a traditional Japanese karakuri mechanised automaton of the type that served as the inspiration for the jukebox mechanism. This puppet picks up, "aims" and shoots an arrow from a bow. Q: How did you go about designing the mechanism? Were all the parts hand-made? HS: There was a shaft protruding from the back, so I designed it such that everything would be driven by rotating that shaft. I use a spring in just one place, and apart from that the rest I made myself. The parts are made by cutting them out of a plastic board. Q: What was the hardest part about creating the diorama? HS: That would have to be the shop owner. I made him as a movable figure, and I had a lot of trouble putting in his joints. Another difficult area was the dimensions of the cabinets. Take Space Harrier: its size of the the one in the You Arcade differs from real life. So I hesitated over which one to take. It ended up being neither of the sizes! The Space Harrier cabinet: software modeling (left) and the completed cabinet (right). Q: Have you any experience with stop-motion animation movies and, given how talented you are with the creation of model kits, is it a field you would like to explore sometime? 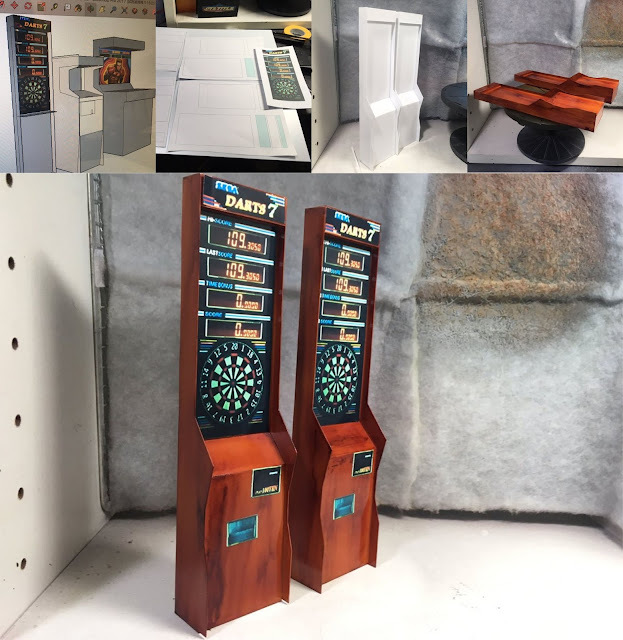 Q: Overseas, Shenmue fans have created objects like the mirrors; after the You Arcade, what other Shenmue models do you plan making? 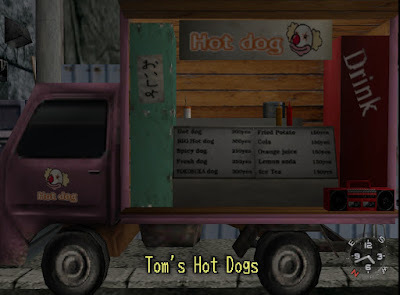 HS: I haven’t decided definitely, but I’d like to make Tom’s Hot Dog truck. Q: Have you considered selling any of your Shenmue models? I’m sure there would be a demand for them overseas! HS: It sounds fun, but there are various complications with obtaining permission from the license-holder and so on, so I haven’t thought about doing something like that yet. HS: You’re welcome, and thank you. Many thanks again to Hiroaki Suzuki for the interview. We look forward to his next Shenmue models! Follow Hiroaki Suzuki's modeling and other creations on Twitter, Instagram, his YouTube channel and his blog. 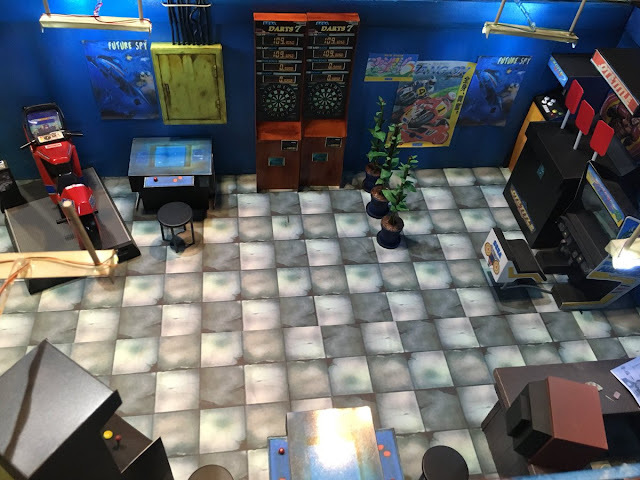 A highly faithful reproduction: the in-game You Arcade (left) and the diorama (right). The various machines of the You Arcade. Owner Yuji Nito at the counter. The smallest details have been recreated, including the newspaper and matchboxes. The ceiling lights have even been fitted with LEDs. The completed diorama: view from above. The awesome Shenmue main theme music accompanying these videos was also performed by Hiroaki Suzuki! This video gives a "fly-over" of the diorama. Phantom River Stone released this post 7 days early for $2 patrons. Become a patron through the button below. Yes, it's almost indistinguishable from the game! I hope Yu Suzuki discovers it too, I'm sure he'd be amazed.